Modern society is completely dependent on payment flows, primarily transfers between the accounts of credit institutions. Cash payments between private customers are decreasing, with movement towards non-cash payments through bank account-based payment systems. Corporate customers pay most of their trade business customers using credit transfers, direct debits or card payments. Cash payments between corporate customers and between the public sector and its suppliers of goods and services are today very rare, especially for repetitive and medium to large payments. Corporate customers, in particular, want to integrate their payments with their data processing systems. They want to be able to process payments in straight-through-processing (STP) mode. Payment transaction costs have decreased with the introduction of modern IT. The combined result is that it is more efficient for corporate customers to process individual invoices and payments instead of processing them in netted batches. 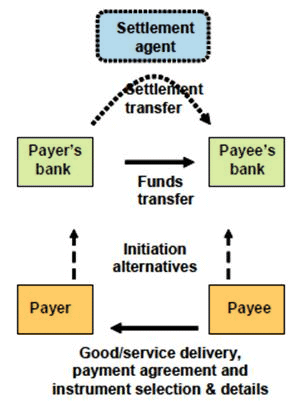 The general payment process and the parties involved can be described using a four-box model consisting of the payer (i.e., the buyer in the trade transaction) and the payer's bank plus the payee (i.e., the seller) and the payee's bank. The banking system and its interbank payment transfer systems provide the primary infrastructure for fund transfers between customers. The process begins with the payer and payee, who agree, as part of a good or service delivery, that a given amount of funds need to be transferred in exchange against the presentation of an invoice. During the contractual negotiation they select a payment instrument acceptable to them both and specify the necessary payment details. In import-export negotiations trading parties can rely on the International Commercial terms - or INCOTERMS - rules: a series of predefined commercial terms widely used in international commercial transactions. The instruction to the bank can be made by either payer or payee, dividing the process into credit push instruments (credit transfers) and debit pull instruments (cheques, direct debits and card payments). The core of all payment processes is the transfer of funds from the payer's payment account to the payee's bank account. Since funds are transferred from one bank to another, there is a need for an interbank fund transfer using a common settlement agent. For reasons of stability, the settlement agent is often a national central bank. There are basically three general network designs: bilateral connections, centralized connections and network-based connections. With bilateral connections, each institution builds up a bilateral relationship with all the other institutions. With centralized connections, a central institution is established, often referred to as an Automated Clearing House (ACH), to which everyone sends their interbank payments, and from which they receive their incoming payments after the sorting process in the ACH. With network connections, a common electronic network with a built-in routing possibility is established between the institutions. The sending bank simply attaches the correct network address to the payment and it is forwarded directly to the receiving bank (comparable to sending emails).